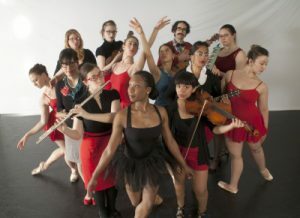 Some years ago, Berklee PULSE filmed the The Michael J. Epstein Memorial Library, as we composed our three-part “Faith in Free” and collaborated with BalletRox (and choreographer Jane Allard) to perform it live at the Strand Theatre (Dorchester, Massachusetts). This feature doc follows our collaborative songwriting/performance journey on this project along with several other bands’ stories of creating new works. How do musicians come together to create? BANDED is an experimental music documentary that chronicles the creative processes of five Boston bands as they take the spark of an idea and turn it into a reality. To capture the process, cameras followed the musicians as they wrote, reworked, recorded, and performed an original song. Along the way, each band was partnered with a Berklee College of Music faculty member to help hone their skills. The eclectic bands represent a spectrum of genres ranging from world-soul and indie-baroque to americana, psychedelic, and indie rock. BANDED connects music theory to real world musical collaborations, along the way capturing the struggles and successes of what it means to be a musician in today’s creative landscape.